Alena graduated from Maryville University of St. Louis with her Bachelor’s Degree in Health Science in May 2016 and also her Doctorate of Physical Therapy in December 2018. She is currently working at the Wentzville location. Originally from a small town in Illinois called Teutopolis, she could not stay away from St.Louis since attending school and is excited to be back in the St.Louis area. 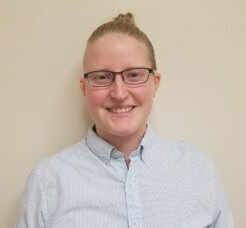 She has an interest in aquatics, manual techniques, lower extremity injuries, sports, and working with people of all ages. Alena enjoys sunshine, movies, photography, spending time with her nephew, and outdoor activities such as biking, hiking, and swimming.